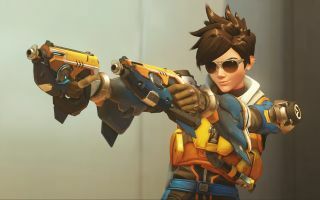 If you're lucky enough to have access to the Overwatch beta, or if you just like to follow video game controversies, then Tracer will be familiar. She's the dual-pistol wielding mascot for Blizzard's forthcoming hero shooter, and she packs some special skills to compliment her ability to shoot all scum that sullies her path. These include a fancy dash, which she'll bring to Heroes of the Storm later this month. The video above provides a glimpse at how she'll influence the field once she hits the MOBA. Interestingly, she'll be the first hero with the ability to shoot while moving. I don't suppose her pistols will pack a huge punch, but she has a Heroic ability with three major upgrade branches. Here's Blizzard's official description: "Equipped with the chronal accelerator designed by her gorilla scientist pal Winston and a pair of deadly pulse pistols to match, this highly mobile ranged Assassin zips around the Battlegrounds of the Nexus, catching enemy heroes off guard and then vanishing before they have a chance to react." If you'd prefer to play her in an FPS, Overwatch hits PC on May 24.